Karachay-Cherkessia is a region in the Russian Caucasus bordering Krasnodar Krai to the west, Stavropol Krai to the north, Kabardino-Balkaria to the east, and Georgia to the south. Karachay-Cherkessia is named for the Karachay, a Turkic people, and the Cherkess, the group from which "Circassians" get their name. The region was absorbed by an expanding Russian Empire in the first half of the 19th century. In the 20th, the divide-and-rule tactics of the Stalin era involved weakening resistance by splitting related groups and joining unrelated ones in shared administrative units. As part of this pattern, the Karachay-Cherkessia Autonomous Region was first created in 1922. Several further administrative adjustments and readjustments followed. In 1943 the Karachay people were deported to Central Asia for alleged collaboration with the Nazis. They were allowed back in 1957 and the Karachay-Cherkess autonomous region recreated. Although it has not experienced the levels of violence seen elsewhere in the North Caucasus, the republic lives in the shadow of the troubles which have plagued the region. Russian forces have mounted numerous security operations and reported foiling intended attacks by Islamist militants. Since then, a succession of kleptocratic governments have followed, leaving the precious earnings of it's natural resources into the hands of few people. Today, Karachay-Cherkessia remains poor, especially in Cherkessk, where there has hardly been any economic development in the past few years. Poverty is widespread, and it is more severe than any other region in Russia. The Karachay speak Karachay-Balkar., a Turkic language; the Cherkess speak Cherkess, a dialect of Kabardian. Visitors may count their blessings that all are fluent in Russian. 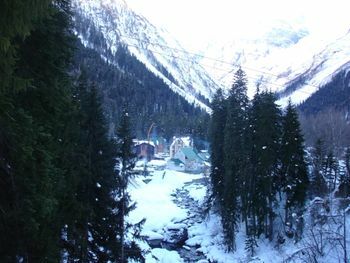 Karachay-Cherkessia is the safest of the republics of the North Caucasus, being most remote from the conflict epicenters. It is still not as safe as the nearby Sochi region in Krasnodar Krai, however; travelers should be vigilant especially against harassment from officials. This page was last edited on 25 June 2016, at 09:27.